total 223 vacancies of Supply Inspector posts available in this BPSC 64th CCE recruitment. Those who are looking for these Department of Food and Consumer Protection vacancies they can apply online from 03-08-2018 to 31-08-2018 through Bihar PSC website of BPSC.bih.nic.in. Supply Inspectors recruitment of BPSC will be held through in the form of 64th CCE combined competitive prelims exam and 64th CCE mains examination. Category wise Vacancy details, age limits, educational qualification, 64th CCE preliminary exam pattern, syllabus and online form submission process and details for BPSC Supply Inspector (Aapurti Nirikshak) of Department of Food and Consumer Protection recruitment exam notification are given below. Applicant must have qualified degree from a recognized university. For Gen Male 22-37 years, For Gen Female, BC/MBC candidates 22-40 years and for SC/ST 22-42 years. Selection for this BPSC Supply Inspector recruitment 2018 will be held based on 64th CCE Combined Competitive Preliminary Exam, Mains Exam and Interview. 64th CCE Pre Exam conducted in the form of objective type. 64th Combined Competitive Prelims Exam will be conducted for 150 marks. All the questions are objective type only. Those who are qualified for the 64th CCE Combined Competitive Prelims Exam they have to apply separately for 64th CCE Mains Exam. Online applications only accepted for this SI Jobs of BPSC recruitment through www.BPSC.bih.nic.in. Online form submission last date is 31-08-2018. But candidates have to register online on or before 20-08-2018 and last date for fee payment is 24-08-2018. 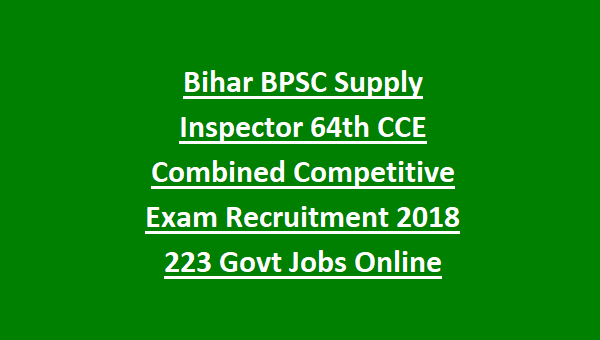 Click here to apply online for the BIHAR PSC Supply Inspector Recruitment 2018. 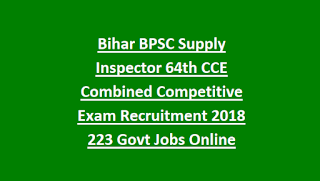 Click here to see the official notice of BIHAR PSC Supply Inspector Recruitment. Please share this BIHAR PSC Supply Inspector (Aapurti Nirikshak) Recruitment Examination 2018 article to your friends.